A Wisconsin man was left to redecorate his entire apartment early last week after his girlfriend of three years moved out, taking nearly everything with her. 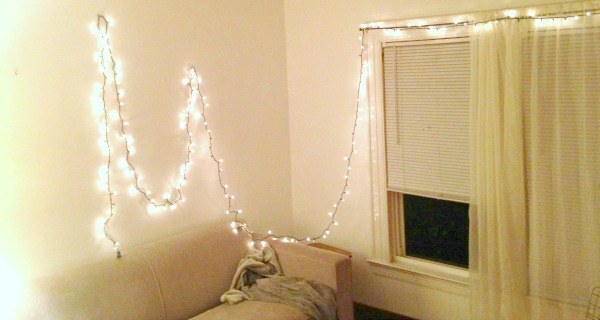 With few ideas, and a willingness to spend “no more than around $5,” Madison resident Daryl Brown declared a single strand of white Christmas lights would suffice in decorating his entire apartment. The change to his living arrangement came somewhat abruptly, leaving Brown to think and act without much consideration, or so it seems. After weighing his many options thoroughly, Brown settled on the choice he remains confident was the correct one, before heading home with a clear idea in mind. When the twenty-three foot strand of lights failed to reach past the only remaining piece of furniture in the room – a five-year-old Jokkmokk table set from Ikea – Brown was forced to improvise. “I’m actually good with it just like that,” Brown remarked of his flimsy installation, in which six of the one hundred bulbs had already somehow burned out. While Brown remains happy with his decorative choice, the strand of lights deemed responsible for filling the literal void left by his now-ex “soulmate” remained unable to share his excitement.